Backyard Fly Fishing - Discovering Great Fly Fishing Close to Home! Electronic reader version for Kindles, Nooks, tablets, etc. Do you ever wish you could fly fish more, closer to home? Whether you are a seasoned pro or a beginner, everyone is looking for the next "Secret Lake"! The book covers specific techniques to uncover little known secrets within a short drive from your home to catch big fish and lots of them! - How to find the best lakes and rivers to fish. - How to find which sections of river hold the most and biggest fish. Brad Miller teaches you little known secrets to locating and enjoying hot spots within a short drive from home. You will learn how to tap local resources to extract public information most people do not know even exists! You will get a list of the top flies for each specie of fish and how to pursue them on lakes and rivers. 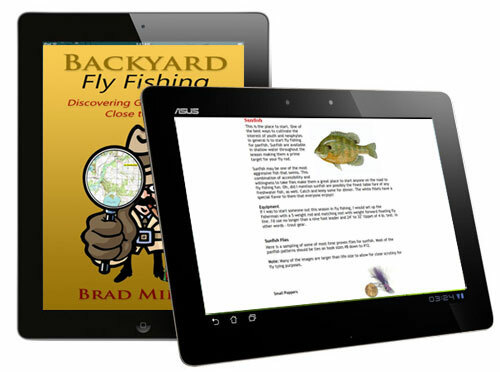 Backyard Fly Fishing is the new eBook from Brad Miller, the creator of FlyBass.com and author of Top Ten Smallmouth Flies. Very well written and entertaining book. Informative and a joy to read. "I've known Brad as a friend to the regular guy who wants to get into fly fishing. Hey, the big name trout streams and the purist approach is great, but the real secret is that if you want to have a lot of fun on a regular basis, Brad will show you how to find, fish for and catch all kinds of great but sometimes overlooked fly rod species. His new book really gets down to the nitty gritty of - as he calls it - backyard fishing. I've been doing this approach for years - finding those little lakes and ponds that no one else really pays attention to - and having a ball catching fish close to home. Meanwhile, other guys sit in their living rooms whining that they can't afford the time or money to go off to some exotic place on the planet. I picked up some VERY useful ideas and tips about how to take my local explorations farther. My advice is, listen to Brad, use his hints and get out there. As he likes to say 'Fun Waits for No One!'" POTENT, POWERFUL and a PLEASURE TO READ! The practical truths, solid examples, and memorable antidotes give the book it's special potency not found in a lot of other fishing books. Written in an easy yet passionate style the author helps the reader short cut through many of the common mistakes and falsehoods in thinking about places to fish, how to fish and what to fish for. Then like a seasoned guide Brad cuts through the underbrush of prejudice to clear a path for the reader to enjoy even more fruitful fishing in the places they both love and are easiest to get to...those closest to home. Brad MIller is a man on a crusade to see fly fishing, great fly fishing, something not limited to those who can afford the exotic trips that grace the covers of the glossy fishing magazines. In Backyard Fly Fishing he holds that banner high and then plants it to fly above your, often over looked close by, fishin' hole. Pick up your copy today...you'll be glad you did.